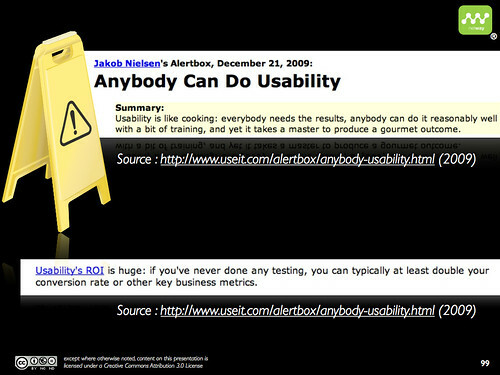 In a December 2009 post (http://www.useit.com/alertbox/anybody-usability.html), useit.com claims that with little knowledge on the subject of usability and after only 3 days of testing, you can typically at least double your conversion rate or other key business metrics. “Many people without a grounding in behavioural user-research principles use bogus methodology and thus get misleading findings. Poor methodology is especially common for eye-tracking studies, and thus most published studies in this area are wrong”. My team recently worked on a project for a pure Internet player. Their senior staff, which came from various web disciplines, including usability, changed some elements on a landing page and saw their conversion rates fall with more than 30% in less than a week. So let’s keep our feet on the ground… Not only are their more and more digital screens, user behaviour – present company included – also changes at a staggering pace. We need ever more sophisticated techniques to build result-driven interfaces. I think a chef has more than just some basic knowledge about cooking. I also believe one needs more than just a set of guidelines to obtain the same result as a chef. A chef is no less than a professional of taste who knows all there is to know about a product. It is this in-depth knowledge that enables him to time after time create incredible dishes without needing a recipe. 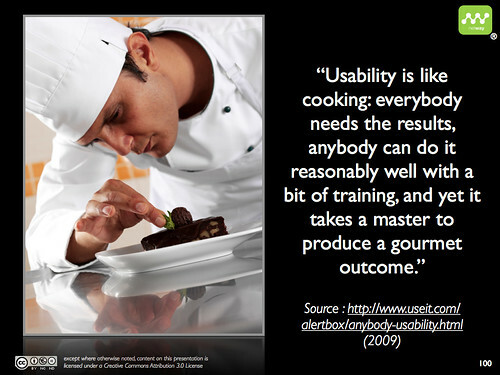 Usability will always be the type of cuisine anyone can use if he applies regularly updates rules. But it will never be the solution to constantly create efficient screens. Neuromarketing can be compared to the cuisine based on the fundamentals of taste (what customers want and expect, an in-depth knowledge of products,…). It combines all these fundamentals to obtain a high-quality result, whatever the dish to be made. Marc you raise very good points and I do not agree with this article. I like the analogies but the truth of the matter is you can learn to set up and run a usability test in 3 days but that does not mean you can moderate it without “leading” the test participant. One needs to be skilled, experienced and educated enough to understands the nuances of behavior, or your collecting and acting on bad data. I liked what Susan Dray wrote and it went something like this: She was moderating and then let her assistant take over and she was appalled to watch him lead the test participant down the interaction path. I am sure her assistant had more than 3 days of training. Jakob has to write this or he could not sell his usability training same goes for HFI. I have noticed in my years that a good usability analyst is not necessarily a good UI designer. etc. I have seen how such articles and people are bastardizing the profession. As a engineer with a Human factors degree, this is appalling to not only me but to everyone who put in 2 years of sweat to get their Master’s degree.